This month’s Purpose Driven Woman is a dear friend, Tokeitha Wilson of Empowerment Station. She is a mother, a survivor of domestic violence, a motivational speaker, and the author of Too Precious to Be, where she shares her life story of disappointment, heartbreak, abuse, and restoration. With a solid foundation of self-confidence and self-awareness, she rose to the surface and discovered her purpose while embracing every phase of embarrassment and shame. She has lived to tell her story and is walking boldly in her purpose as she empowers women who are suffering in silence. This interview was not the easiest because I've known Tokeitha for many years now and had no idea that she was suffering. It was heartbreaking to listen to her recount some of her experiences [which you will have to read in the book] but I am thankful that she is bold enough to share and I know that her story will inspire others. How did you know this was your purpose? I knew it was my purpose because I was running from it. It was me, it was my story. Behind the curls and the pearls I was suffering in silence. Behind the 'image', I was suffering. I was willing to help everyone else but myself. And finally I couldn’t run anymore. What has been the most challenging part of walking in your purpose? Support. Everyone will say they believe in you but when you say ‘I’m writing this book’ [about suffering in silence] they start asking questions like “Wow, why would you do that?” I’ve learned that not everyone is truly happy for you. Your win is not a celebration for everyone; for some [when you win], it’s like “this girl gets on my nerves, who does she think she is?” I’ve had to learn how to weed out people and understand that my circle will get smaller. I was afraid of dealing with me. I’m my own worst enemy and I had to deal with me. I was afraid of what people would think of me. I wondered if they would judge me. [She sighs] I could have healed a long time ago but I spent so much time living in the past that I couldn’t move on. I learned that I am not exempt from anything, including pain. I learned to love, forgive, and let go. I learned that my purpose will cover me- when the attacks come; I am covered by my purpose. How did you begin to heal and move forward? Ok, after I walked away from the abuse I talked about it for three years. I questioned everything, every day. The same thoughts and questions every day: “I can’t believe he did this to me. How could this happen? I can’t believe I don’t have my family, etc.” I literally fed it for three years. I was angry, I was bitter, I was stuck, for three whole years after the abuse had ended. One day, my best friend said to me “I swear I think you’re going insane. I’m praying that you will get through this, I wish you would stop it.” And finally - not immediately - I just didn’t talk about it one day. And then the next day, and then the next, until finally I was no longer feeding it. [She sits in silence for a few moments, takes a deep breath, and then speaks] Although I saw myself [in my dreams] on different platforms, speaking and sharing, it was easier to believe the negative things from the past. And it was very difficult once the attacks got stronger at every level - spiritually, mentally, emotionally, and financially, which tends to happen the more boldly you walk in your purpose. But my purpose covered me. Your purpose has insulation; it covers you. Why now? Why are you walking so boldly in your purpose now? Because I am better. Am I the best me? I wouldn’t say that I am my best me because I’m still a work-in-progress but I am better. And if I don’t do this now, I’ll be being disobedient to God's will. Trust your intuition: it’s there’s for a reason. Pay attention. Be aware. Know your weaknesses and work on them. Identify your strengths and flourish in them. You’re unstoppable once you start to operate in your purpose. I know that the call on me is a big one. And people may not know my name, but my name will be great. I feel good because I’m doing what I’m supposed to do. 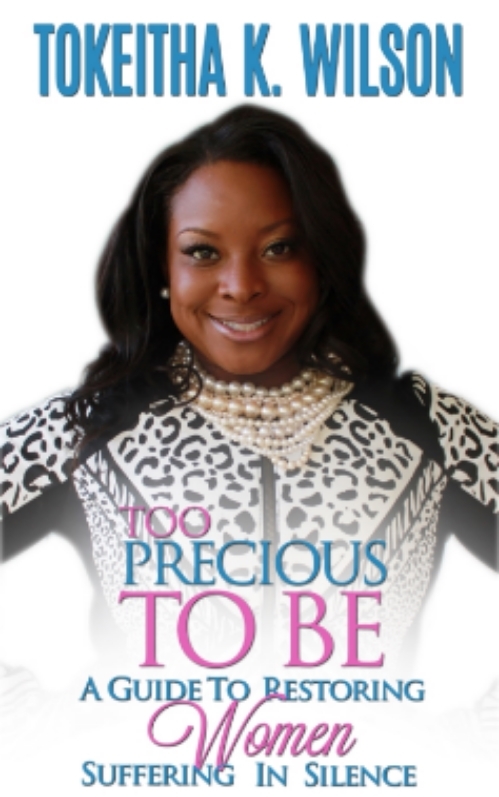 To learn more about Tokeitha’s compelling story of truth, triumph, and tenacity click here to pre-order her book, Too Precious Too Be. October is Domestic Violence Awareness Month (DVAM).